Diseases of the adrenal gland are relatively rare. The most common reason that a patient may need to have the adrenal gland removed is excess hormone production by a tumor located within the adrenal. Most of these tumors are small and not cancers. They are known as benign growths that can usually be removed with laparoscopic techniques. Removal of the adrenal gland may also be required for certain tumors even if they aren’t producing excess hormones, such as very large tumors or if there is a suspicion that the tumor could be a cancer, or sometimes referred to as malignant. Fortunately, malignant adrenal tumors are rare. An adrenal mass or tumor is sometimes found by chance when a patient gets an x-ray study to evaluate another problem. What are the symptoms of adrenal gland problems? Patients with adrenal gland problems may have a variety of symptoms related to excess hormone production by the abnormal gland. Adrenal tumors associated with excess hormone production include pheochromocytomas, aldosterone-producing tumors, and cortisol-producing tumors. Some of these tumors and their typical features are given below. Pheochromocytomas produce excess hormones that can cause very high blood pressure and periodic spells characterized by severe headaches, excessive sweating, anxiety, palpitations, and rapid heart rate that may last from a few seconds to several minutes. Aldosterone producing tumors cause high blood pressure and low serum (blood) potassium levels. In some patients this may result in symptoms of weakness, fatigue, and frequent urination. Cortisol producing tumors cause a syndrome termed cushing’s syndrome that can be characterized by obesity (especially of the face and trunk), high blood sugar, high blood pressure, menstrual irregularities, fragile skin, and prominent stretch marks. Most cases of cushing’s syndrome, however, are caused by small pituitary tumors and are not treated by adrenal gland removal. 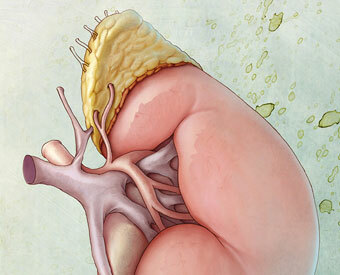 Overall, adrenal tumors account for about 20% of cases of cushing’s syndrome. If there is a suspicion that the tumor could be malignant. Adrenal gland cancers (adrenal cortical cancer) are rare tumors that are usually very large at the time of diagnosis. Removal of these tumors is usually done by open adrenal surgery. If an adrenal tumor is suspected based on symptoms or has been identified by x-ray, the patient should undergo blood and urine tests to determine if the tumor is over-producing hormones. Special x-ray tests, such as a ct scan, nuclear medicine scan, an MRI or selective venous sampling are commonly used to locate the suspected adrenal tumor. Surgical removal of the adrenal gland is the preferred treatment for patients with adrenal tumors that secrete excess hormones and for primary adrenal tumors that appear malignant. What are the advantages of laparoscopic adrenal gland removal? In the past, making a large 6 to 12 inch incision in the abdomen, flank, or back was necessary for removal of an adrenal gland tumor. Today, with the technique known as minimally invasive surgery, removal of the adrenal gland (also known as “laparoscopic adrenalectomy”) can be performed through three or four 1/4-1/2 inch incisions. Patients may leave the hospital in one or two days and return to work more quickly than patients recovering from open surgery. Results of surgery may vary depending on the type of procedure and the patients overall condition. Are you a candidate for laparoscopic (keyhole surgery) adrenal gland removal? Prior to the surgery, some patients may need medications to control the symptoms of the tumor, such as high blood pressure. Patients with a pheochromocytoma (see previous page) will need to be started on special medications several days prior to surgery to control their blood pressure and heart rate. Patients with an aldosterone-producing tumor (see previous page) may need to have their serum potassium checked and take extra potassium if the level is low. Patients with cushing’s syndrome (see previous page) will need to receive extra doses of cortisone medication on the day of surgery and for a few months afterwards until the remaining adrenal gland has resumed normal function.